Junior point guard Candice White playing against Fresno Pacific at the Save Mart Center on Nov. 3, 2017. (Daniel Avalos/ The Collegian). The Fresno State women’s basketball team fell short on the road this Saturday against Texas State, 76-59. Of the ‘Dogs’ 59 points, 20 came from junior Candice White, who posted her season high. Freshman Maddi Utti also recorded her first career double-double with 12 points and 10 rebounds. 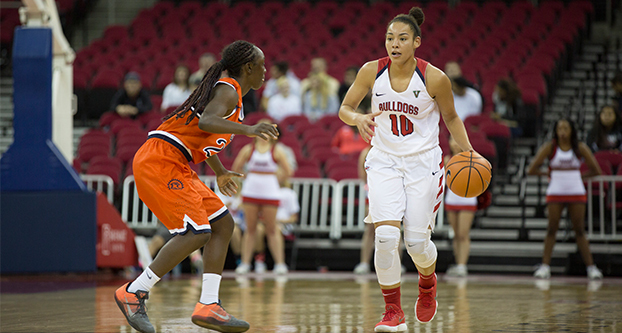 She is the first Fresno State player to record double-digit rebounds in a game this season. Starting the game, both teams were making only 21 percent of their shots. The ‘Dogs were able to climb to a 14-10 lead early in the second quarter after a pair of free throws. Even with White’s and Utti’s efforts, the team could not hold the Bobcats. Taking the lead after a 14-2 run and a 3-pointer from freshman Chania Wright in the second quarter, Texas State gained momentum. With five minutes remaining in the second quarter, a layup from Utti sparked a 3-pointer from junior Breanne Knishka and a 7-0 run by the ‘Dogs, trimming the Bobcats’ lead to 38-26 at the half. Back from half, the ‘Dogs were on fire while going on a 14-3 run to cut Texas State’s lead to 6 points with just under six minutes to play. White and Utti were then quick to score a total of 12 points, but were overruled by a 14-0 run by the Bobcats after two 3-pointers from junior Toshua Leavitt. Texas State’s Leavitt was a main factor in the ‘Dogs’ fall. She scored 28 of the Bobcats’ 76 points while also recording six 3-pointers. In the end the ‘Dogs lost by 17 points after a 3-pointer by freshman Aly Gamez in the last two seconds of the game. 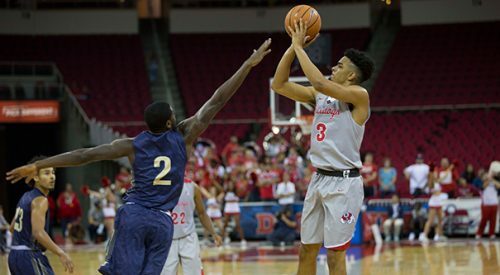 Fresno State will be back in action Nov. 30 at UC Santa Barbara and then at California State University, Northridge on Dec. 2.